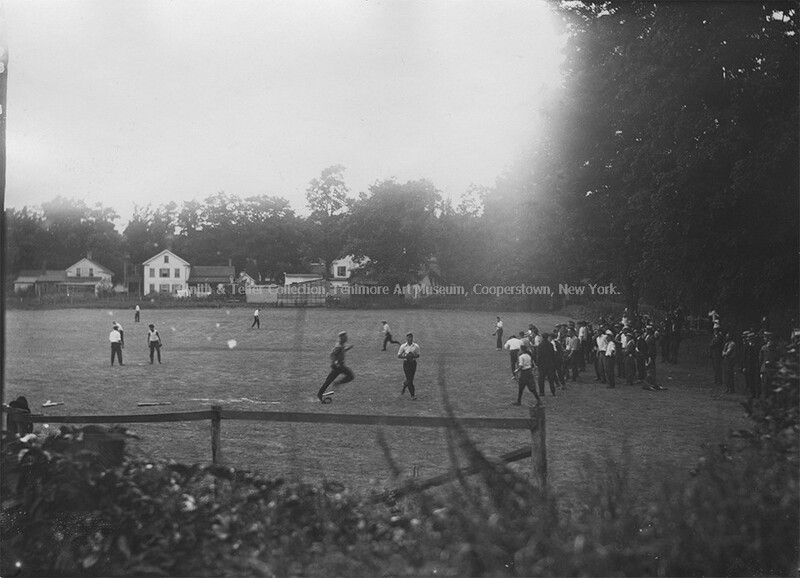 In 1919, when the Cooperstown Chamber of Commerce first obtained the lease on Phinney’s lot with the intention of re-christening it Doubleday Field, the land was undeveloped pasture. The village’s swift decision to develop the lot aligned with cross-country trends that standardized ballparks. 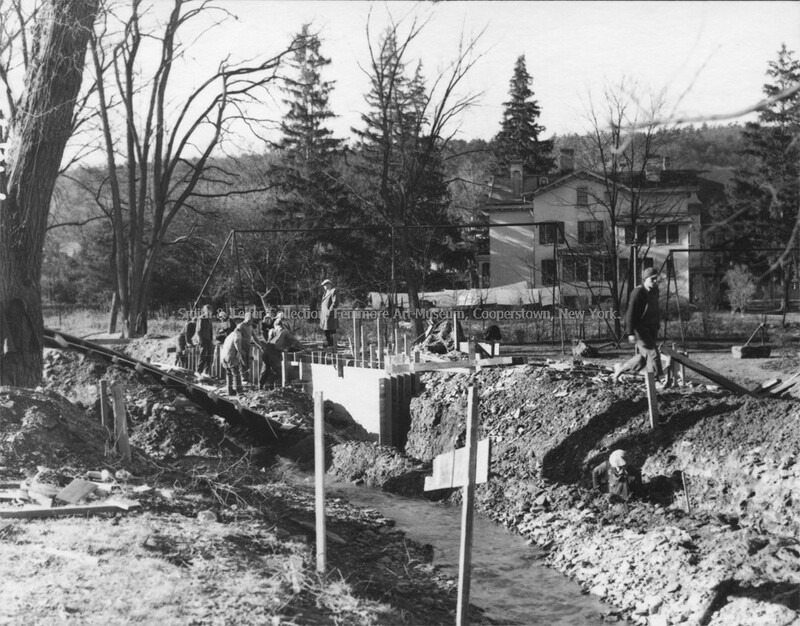 In 1923, the Cooperstown Chamber of Commerce sold the land to the Village of Cooperstown for $1,275; the deed stipulated that the Village of Cooperstown would “hold the above described real estate for all time as a baseball field and recreation park, and the same shall forever be known as Doubleday Field in honor of Abner Doubleday as the founder of baseball”. 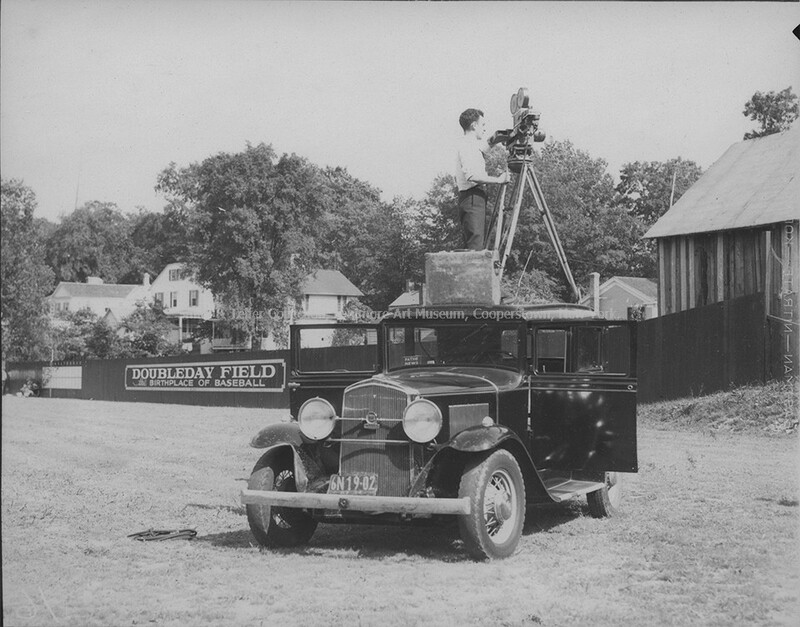 Between 1921 and 1923, the village took the first step in developing the field by building a makeshift grandstand. This grandstand, a temporary wooden structure, was paid for with a donation made by movie theater mogul William Smalley. 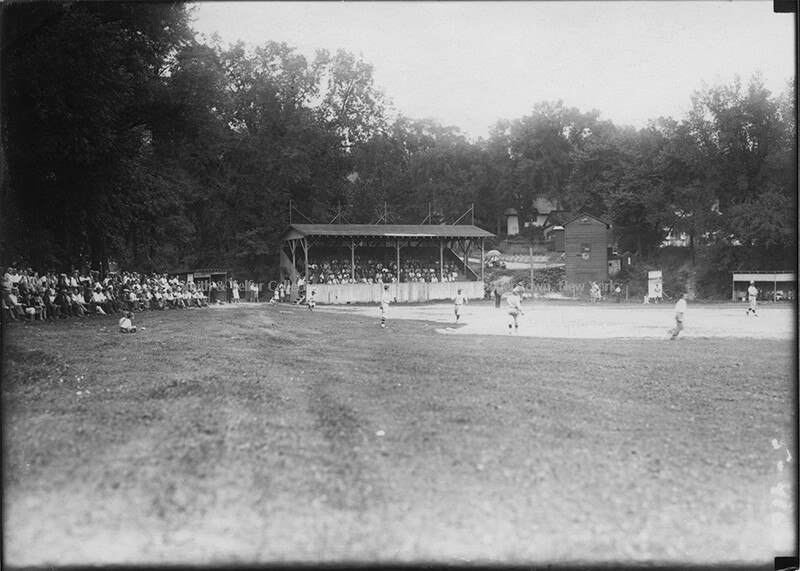 By 1924, Cooperstown villagers were advocating for a more permanent grandstand on Doubleday Field. “Certain improvements [are] badly needed to make Doubleday Field safe for baseball stars,” observed the Freeman’s Journal. Many locals gave money to build the permanent grandstand, and some donated their time and labor. On May 14, 1924, the Freeman’s Journal officially announced that a new grandstand was being constructed. This 250-seat wooden structure, “substantial and up to date in every way,” was rectangular in shape, with a roof to protect fans from the elements. 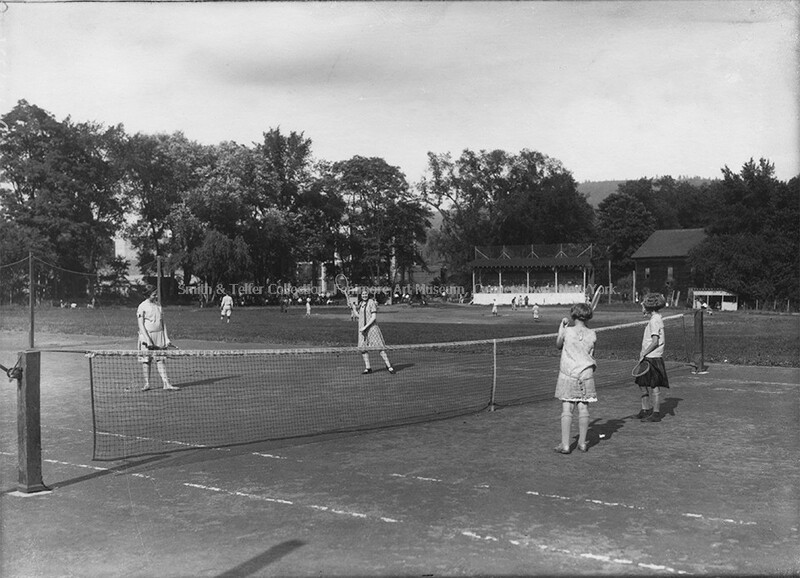 This grandstand had its official opening on June 4, 1924; a chilly summer day on which the Cooperstown Independents played Herkimer. The 1930s brought major renovations to the field that included new and improved fences. Photographs from the 1934 dedication show a six-foot wooden fence along the outfield, similar to a modern privacy fence. This fence held a scoreboard and the painted sign, “Doubleday Field Birthplace of Baseball”. In addition, in April, 1933, Mr. F. Ambrose Clark had a bandstand moved from the fairgrounds and placed on the Doubleday parking lot property immediately northeast of the baseball field. As the field was improved and use increased, Doubleday Field neighbors sold additional parcels of land to expand the field and its appurtenances. In 1937, Mary Louis Bancroft Phinney sold a piece of her land adjacent to the northeast side (left field) of Doubleday Field to the Village of Cooperstown. Henry Fabian, groundskeeper for the New York Giants, was sent to Doubleday Field in 1938 by Major League Baseball executives. He was tasked with reviewing the stadium for the upcoming baseball centennial celebrations and exhibition games. Fabian’s suggestions to Cooperstown village officials included renovation of the bleachers to increase the seating capacity of the stadium. Materials for the grandstand were salvaged from the recently demolished Otsego County Fair grandstand. 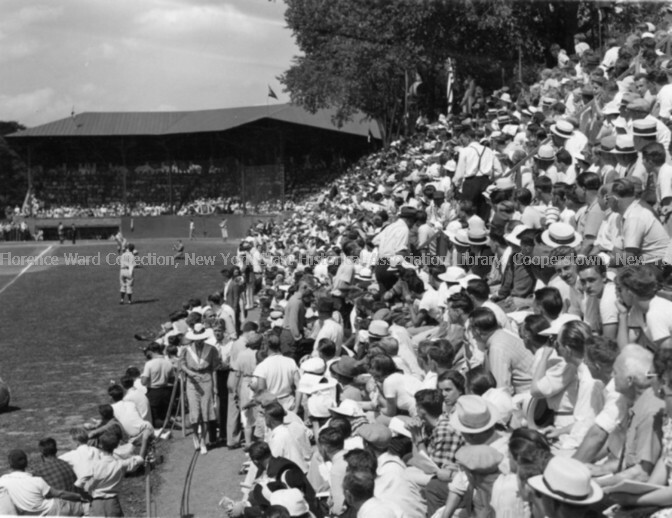 The use of materials from this older structure, especially its steel supports and decorative details, gave the Doubleday Field grandstand a decidedly “old fashioned” feel, even in 1939. Funds from the Works Progress Administration were also used to construct new wooden bleachers along the first-base side and across the outfield of the playing field during 1938 and 1939. Doubleday Field added 4 new photos.